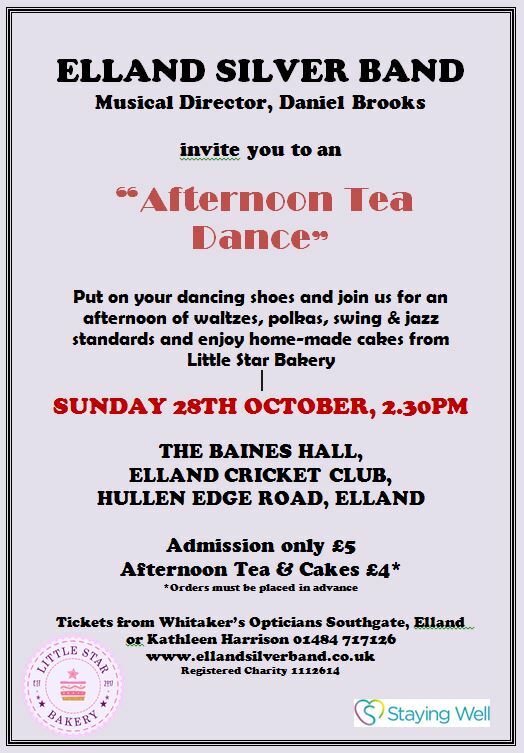 Put on your dancing shoes and enjoy an afternoon of waltzes, polkas, swing & jazz standards with Elland Silver Band on Sunday 28 October, 2:30pm-4:30pm at Baines Hall, Hullenedge Road, Elland HX5 0QY. Enjoy home-made cakes from Little Star Bakery. This event is supported by the Calderdale Staying Well Project. Admission tickets are £5 each, and tea/coffee and cakes can be ordered in advance for an additional £4 per person. Contact Kathleen Harrison on 01484 717126. This entry was posted in Elland, Events, Oct.
Lower Valley Friday Flyer 28 September – OUT NOW! !